Today we will explain you about Solar Energy. The energy produce and given by sun is known as solar energy. 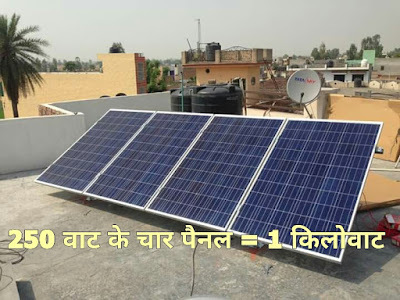 This solar energy is converted into electrical energy by solar panels and this solar energy that produces heat is also used for cooking and many other things.Solar energy is normally Sunlight and Sun light heat that is converted and used. So here we mainly tell you about Solar Energy that is converted into electrical energy by Solar Panels. Basically Solar Panels converts sun light into electrical energy. Sunlight contains photons. When sunlight is absorbed by solar panels materials, the solar energy knocks electrons loose from their atoms, allowing the electrons to flow through the material to produce electricity. This process of converting light (photons) to electricity is known as the photovoltaic effect.This is basically a technology that converts photon or light into electrical energy. A solar panel is basically a collection of many solar cells,that can be used to generate electricity through photovoltaic effect. These cells are arranged in a grid pattern on the surface of solar panels with a glass. Thus, it may also be called as solar module, mounted on a structure supporting it. 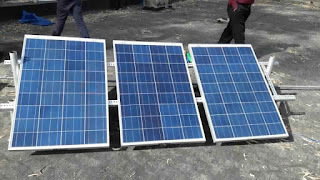 A solar panel is a packaged and connected assembly of 6×10 solar cells.